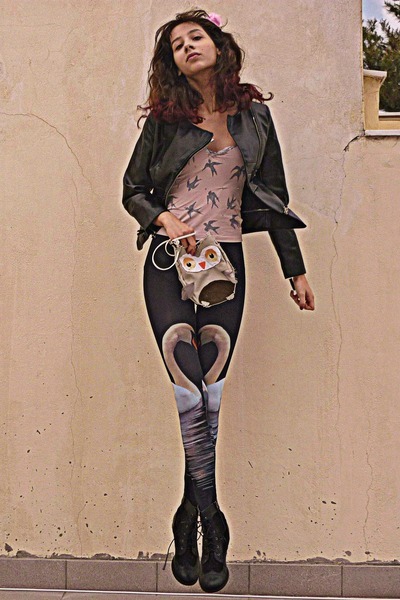 Birds, birds, birds… How I adore wearing bird themed outfits… Makes me flying higher in my pictures:P I adore those stunning swan Romwe leggings. This amazing leather jacket is from VJ-style. The owl bag and swallow top are both DIY. the leggins are really unique! love how the jacket + boots make the outfit rougher! i like! Those leggings are so unique! This is stunning! Did you screenprint the top? i love the legging and your body shape is great. still love those leggings! cute top, too! love the little bead details!